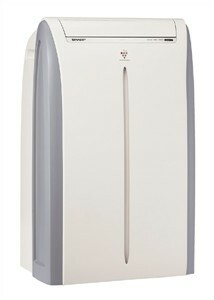 What size BTU portable air conditioner do I need for an apartment? In the midst of the July heatwave, Comfort House customer Roger (not his real name), who lives in an older apartment building in Pittsburgh, received his order for two 13,000 BTU portable air conditioners. He plugged them in and they cooled his apartment down nicely. In the middle of the first night something not so nice happened; the air conditioners shut off. He turned them on the next night and in the middle of the night they shut off again. This went on for several nights. Roger woke up each morning hot and unhappy. We went thru all of the troubleshooting measures with Roger such as were the units being operated within room temperature specified in the instructions? If a unit falls below the limit, in this instance 64°F, it can freeze up. Was the water tank filling up? Models containing a dehumidifier, as these did, have a water tank that when full will cause it to stop until emptied. Was it operating in sleep mode or timer mode? "No, no, and no," said Roger. The symptoms Roger experienced were not described in the product manual. Roger spoke to the manufacturer’s troubleshooting hotline and they also were unable to identify the cause of his power shut off problem. However, since he bought two units, all of the parties involved, including Roger, believed it was unlikely to be caused by a defective product. Roger contacted a local heating and cooling company and they advised him that excessive power draw was the likely culprit for the intermittent shutoff. A 13,000 BTU portable air conditioner operates at 1550 watts compared to 1100 watts for a smaller 10,000 BTU unit (these figures should be used as general guidance since specifications will vary between manufacturer). The problem when purchasing a portable air conditioner and then finding it’s not suitable is that almost universally they are not returnable. They are specifically excluded from most retailer return policies once opened. And as Roger pointed out, it was his fault for not correctly gauging the amperage in his apartment. We worked with Roger to ensure he had portable air conditioners that would meet his apartment's power requirements. It wasn’t exactly an inexpensive proposition for him in UPS shipping costs back and forth but his alternative was waking up each night to restart his air conditioners (not to mention the safety factors involved with overloading his circuits). The 13,000 BTU models were replaced with 10,000 BTU models. We suggested he start with only one this time to ensure it worked for him. It worked fine the first night without any power interruption. We then sent the second, and now both units have run trouble free for the past week. Roger is sleeping comfortably and is happy. The moral of the story is less BTU is probably better when living in an apartment building and especially an older one. In addition, always buy one portable air conditioner first to ensure it operates properly with your dwelling’s wiring before purchasing more.